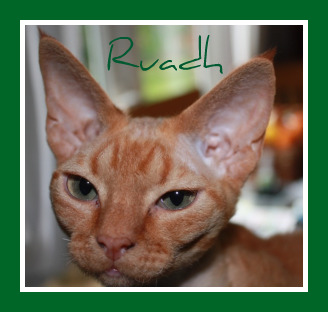 Ruadh is our redhead with attitude to match. She is a very self contained young lady who had inherited her father's lovely gentle nature. Ruadh has produced some stunning kittens, her latest batch being good enough that all four are of show potential Gracie has gone to live with my friend Gina and Hector has gone to live in Ireland as a potential stud boy with Charlotte and Ronan. I dont often let any ktitens go for breeding, so to know these were good enough is really good for the breed.